Closed-circuit television (CCTV) is a system where video feeds are transmitted within a closed system from security cameras. Video streams are only available to authorized users. 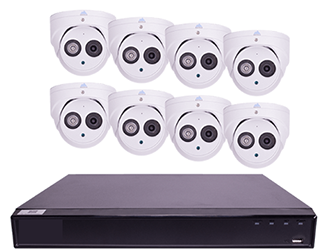 Whether you use a one-camera system, a four-camera system, or an eight-camera system, CCTV surveillance cameras are an easy way to upgrade your security system. D-Blaze CCTV systems include DVR recording, hi-definition IR cameras, low noise and distortion. D-Blaze will customize your system to meet your needs to protect your family, property and valuables. Offers DVR with option of up to 4 cameras. Offers DVR with option of up to 8 cameras. Offers DVR with option of up to 16 cameras. Please contact us for your individual/customized quote or call us today at 336-629-3300.